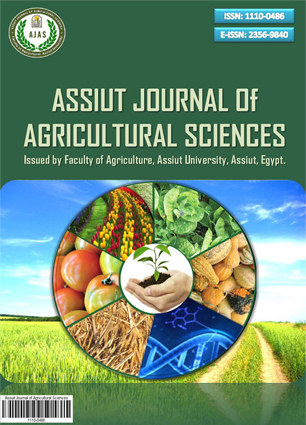 The present study was carried out at Assiut Agricultural Research Station during 2007/2008, 2008/2009, 2009/2010 seasons. Diallel cross without reciprocals among eight parents of durum wheat namely, Sohag 3 (P1), line #1 (P2), line# 2 (P3), Bin- Sweef 1 (P4), Bin- Sweef 5 (P5), Karifla (P6), Altar 84 (P7) and Admor (P8) were used to estimate heterosis, and general and specific combining ability under recommended and late planting dates. Mean squares showed that highly significant differences among genotypes, parents and crosses for all studied traits in the F1's and F2 generations, except number of spike/plant under late planting date. Moreover, both general (GCA) and specific (SCA) combining abilities were highly significant for most studied traits in the F1's and F2 generations under both planting dates except grain yield/plant, biological and number of kernel/spike in the F1's under late planting date in the SCA .The estimates of heterosis for grain yield/plant indicated that seven crosses out of 28 F1's hybrids significantly surpassed their better parent with percentage ranged from 8.798 (P4×P7) to 41.22% (P1×P6). These relatively high heterotic percentage along with the variability existed among all diallel set increase the chance of good recombination's that can be isolated in the following generations particularly, when selfing in the following generations gives an essentially homozygous state and enhances the role of selected plants in reducing the effects of dominance. However, the additive gene effect was of great importance in the performance of the most studied trait i.e. No. of spikes/plant, grain yield/plant (g), biological yield/plant (g), number kernel/spike. Moreover, the parents P 7 and P4 were good combiners for four traits i.e. Number of spikes/plant, grain yield/plant (g), biological yield/plant (g), number kernel/spike while, P2 was the best for only three traits i.e. days to heading, maturity and number kernel/spike date in the F1's and F2 generations. Meanwhile, significant SCA effects for grain yield were found in four out of the 28 F1's crosses P1×P4, P1×P6, P4×P7 and P6×P8 giving positive values of SCA effects under normal planting date and one cross P2× P4 under late planting date. On the other view, F2 populations, one crosses P3× P8 gave positive values of SCA effects .while in the F1'sand F2 generations, only one cross; P3×P8 gave positive values of SCA effects for 100- kernel weight under both planting date. - أوضحت النتائج وجود اختلافات معنویة بین کافة التراکیب الوراثیة فی کل من الصفات تحت الدراسة. وکان التباین الراجع إلی القدرة العامة والخاصة علی الائتلاف معنویا فی کل من الجیل الأول والثانی ما عدا القدرة الخاصة لصفة المحصول والمحصول البیولوجی وعدد حبوب السنبلة فی المیعاد المتأخر فی الجیل الأول. وبتقدیر القیم النسبیة لتباین کل من القدرة العامة والخاصة علی الائتلاف وجد أنها تزید عن الوحدة لصفات محصول الحبوب و المحصول البیولوجی و عدد حبوب السنبلة فی الجیل الأول تحت میعاد الزراعة الأمثل کذلک صفة عدد السنابل للنبات تحت میعاد الزراعة المتأخر. - کما أعطت نتائج مماثلة لصفات عدد السنابل – المحصول – وزن ال100 حبة تحت میعاد الزراعة الأمثل فی الجیل الثانی کذلک بالنسبة لصفة محصول الحبوب وعدد حبوب السنبلة تحت میعاد الزراعة المتأخر. مما یدل علی أن الفعل الجینی المصنف أکثر أهمیة فی وراثة معظم الصفات المدروسة وکذلک کان التباین الراجع لقوة الهجین معنوی فی کل الصفات ما عدا صفة عدد السنابل للنبات للجیل الأول فی المیعاد المتأخر. - کما أوضحت النتائج تفوق سبع هجن علی الأب الأفضل بنسبة تراوحت ما بین 8,798% للهجین (P4×P7 ) إلی 41,22% للهجین P1×P6تحت المیعاد الأمثل للزراعة . هذه التأثیرات غیر الإضافیة لقوة الهجین مع التباین الواضح بین کافة التراکیب الوراثیة تعطی الفرصة لعزل تولیفات جدیدة فی الأجیال الانعزالیة التالیة مقاومة للحرارة. - أوضحت نتائج القدرة العامة علی التآلف أن الأب P4،P7 وهما بنی سویف و Altar 84 أفضل الآباء تآلف فی أربع صفات تحت الدراسة فی الجیلین الأول والثانی. ثلاث صفات منها مساهمة فی المحصول بینما السلالة P2 أفضل الآباء تآلف فی صفة التزهیر والنضج الفسیولوجی وعدد حبوب السنبلة. - أوضحت نتائج القدرة الخاصة علی الائتلاف فی محصول الحبوب أن أربعة هجن أعطت قیما موجبة للقدرة الخاصة علی الائتلاف فی الجیل الأول تحت میعاد الزراعة الأمثل وهجین واحد أعطى قیمة موجبة تحت میعاد الزراعة المتأخر بینما فی الجیل الثانی أعطى هجین واحد قیمة موجبة تحت میعاد الزراعة. - أعطی الهجین Edmor ×line #2 ) P3×P8) قیمة موجبة بالنسبة للقدرة الخاصة علی الائتلاف لصفة وزن إل 100حبة فی الجیل الأول والثانی تحت میعادی الزراعة.